A top financial consulting firm, Unidow Finances Intelligence Services, has, in its recent analysis, ranked Gujarat No 9th in the percentage of growth in gross state domestic (GSDP). 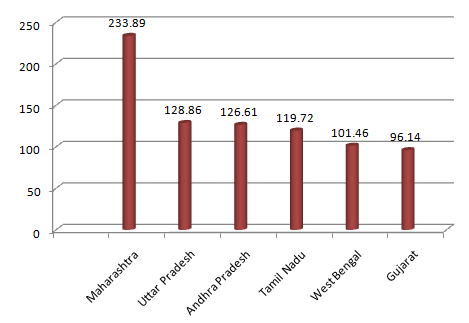 While Gujarat’s growth at current prices in 2012 – for which he made public data – was 15.33 per cent, the states which performed better that Gujarat were Maharashtra (16.86 per cent), Rajasthan (21.91 per cent), Kerala (16.97 per cent), Haryana (16.06 per cent), Madhya Pradesh (19.02 per cent), Bihar (24.40 per cent), Chhattisagarh (18.26 per cent), and Jammu & Kashmir (15.80 per cent). The top consultants has also found that Maharashtra contributes most in the gross domestic product (GDP) of India, with 14.95 per cent, followed by Uttar Pradesh (8.23 per cent), Andhra Pradesh (8.09 per cent), Tamil Nadu (7.65 per cent), West Bengal (6.48 per cent) and Gujarat (6.14 per cent). It is not known why the consultants have not made public figures post-2012, but according to official sources, one of the major reasons could be that Gujarat and a few other states have still not handed over GSDP figures to India’s Planning Commission. The only official information about Gujarat’s state domestic product for 2012-13 is “Statements under the Gujarat Fiscal Responsibility Act, 2005”. Released about a year ago, it finds that the GSDP rate for 2012-13 was 13.98 per cent, at current prices, which is lower than the previous year, for which Unidow – which is based in Noida, which is part of the Delhi National Capital Region – has provided figures. However, being advanced estimates, these cannot be taken as final. More, what the budget book or the consultants do not say is, the current price rate of growth of gross state domestic product (GSDP) does not take into the inflationary factor. According a senior economist's calculation, at constant prices, Gujarat’s growth rate in 2012-13 would be around 5.68 per cent, if what is called “deflator” is taken into account. Gujarat’s deflator, according to this economist, was 8.3 per cent in 2012-13. If this is true, in 2012-13, Gujarat’s growth rate was equal to all-India average. Unidow claims to combine “economic intelligence and research”, helping foreign companies in “scenario planning, selection of unbelievable locations for competitive advantage to maximize profits and improving overall efficiency of different business verticals of a company to mitigate corporate risk such as the political risk, regulatory compliance, geopolitical risk -- whether its strategic or operational risk.” It is, however, not known why it refuses to give GSDP rates at current prices – which show the real growth of each state.